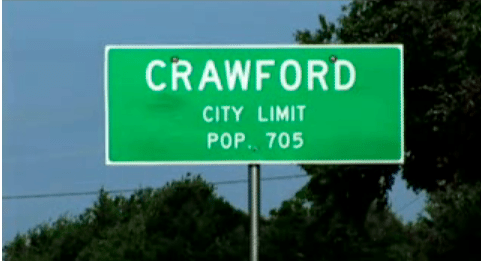 What happens to Crawford, Texas (Population 705) when George W. Bush moves to town. Crawford chronicles the effects of having a controversial high profile resident move into town. The film, directed by Brookline born David Modigliani shot the film over a period of three years. Fascinated with how Bush had made Crawford part of folksy narrative, Modigliani set out to indict him on the his origin myth. A graduate student in Austin, he set out to Crawford to find a story the story. In 1999, Governor George W. Bush bought a ranch in Crawford to set an small-town local “story,” for his upcoming run for the Presidency. The spotlight on the town transformed overnight to a political stage, and exacerbates tensions within the community, pitting the free-thinking against conformity. The town finds itself hosting demonstrations and protests. The film will be screening at the Independent Film Festival of Boston, Saturday, April 26th at 5:30pm at the Somerville Theatre, and Sunday, April 27th at 12:00pm Brattle Theatre. Come out and see the film! The first screening is sold out, but you can buy your tickets for the Sunday screening today at http://www.iffboston.org. And keep watch for a third screening TBD.